A man has been charged after a woman was stabbed at a hotel in Bournemouth. 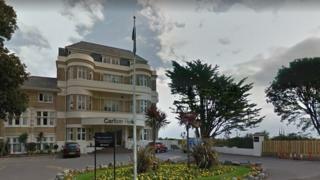 The woman, in her 20s, was found at the Hallmark Hotel Bournemouth Carlton on East Overcliff Drive shortly after 13:15 BST on Sunday. She was airlifted to hospital with multiple stab wounds to her abdomen and hands. Her injuries are not thought to be life-threatening. Adam Jon, 19, of Hounslow, west London, has been been charged with wounding with intent and assault by beating. Dorset Police said the man and the woman, who were staying as guests at the hotel, are known to each other. He appeared before Poole magistrates' earlier and is due at Bournemouth Crown Court on 21 June.